Before buying, I checked their web site and was surprised to find a forum that appears to be actually operational and active. They also seem to release firmware updates on a regular basis. The presence of a RS485 connector for alarm I/O control at the back also indicates the absence of IR LED manual controls. It's a common fact for IP Cameras, the internal wiring and the button (lamp icon) are dedicated to one (alarm I/O) or the other (LED control). For instance, the low-res IPRobot2 offers the opposite: no RS485 but IR on/off control. So unless you rewire it yourself, this camera is not the best candidate for sitting behind a window. The 4.2 mm lens gives a slightly wider fish-eyed view than average. The microphone is very sensitive and the device can be set to trigger an alarm on sound detection. A great point for parents wishing to use it as a baby cam! The embedded speaker is very loud and clear and, at first, it all looks great for 2-way communication, but unfortunately using both speaker and mic. together produces a bad Larsen effect straight away. Plugging an external speaker and placing it away from the unit does help. It is a pity though that Tenvis did not include a volume control in the interface. There's a Micro-SD card slot but little freedom on what to do with it. The memory card is only used as a buffer when the network is not available, and whatever is stored on it gets moved to the network storage when a connection is resumed. Upload to LAN can be done using FTP, NFS and Samba/CIFS (although I couldn't make this one work). The Playback section of the interface gives access to Local (PC drive, not the SD card) and Remote files (the Mini-SD). There is not way to access the camera via FTP but it's of little interest given the way it uses the memory card. The camera runs a telnet service but it is restricted to Tenvis tech. only (secret login). 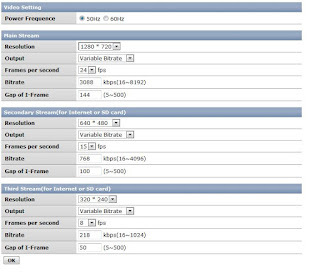 Length and size limit can be controlled quite well for the video files generated. 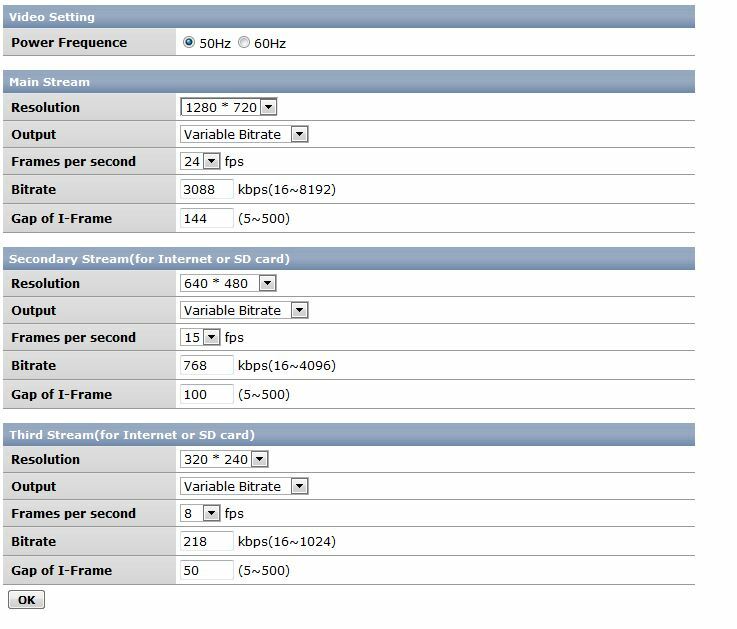 The network connection in 802.11n was stable so far despite the small detachable 2dB antenna. The IPRobot3 is partially compliant with the ONVIF protocol. I say partially because I could not use all the features, like PTZ controls and this is probably why Tenvis does not advertise this point. It allows however 3rd party camera clients like the Synology Surveillance Station or the Onvif device manager to access the video stream. Other standards used are Pelco-D protocol for PTZ control, and P2P which allows a plug-and-play access (automatic detection) from any P2P client. Update 12/12/12: It appears that using the Generic_ONVIF From Synology Surveillance Station often leads to crashing the camera, it is advisable to choose [User Define] as Brand and build the url based on videostream.cgi documented lower. Leave Username and Password fields empty since they will be part of the URL for "Source Path". Smartphone applications like IP Camera Viewer support IPRobot3 directly with PTZ, "Listen", and Presets. 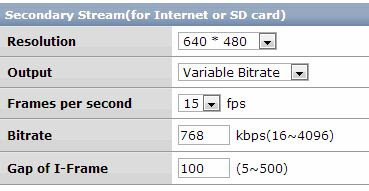 video1 for 640x480 and video2 for 320x240 (unless specified otherwise under the Encoder Parameters). Example: rtsp://admin:admin@192.168.1.1:80/0/av1 will request the audio and video from the secondary stream. The more traditional videostream.cgi and asf also work. For snapshots: http://ipcamURL/snapshot?strm=0 (or =1, =2), just press the snapshot button using a non-IE browser to see this. None of the information above was available from Tenvis unfortunately. Update: on December 7, Tenvis published the streaming instructions on their blog, well done! Little problem... I spent some time fiddling with the upload settings (located in "Record on SD > Network Storage") and could make FTP work. CIFS never worked (Didn't test NFS as I don't enable it on my NAS). But the real problem came after: playing too much with this section of the interface crashed the IP Camera. I had to power it off, and re-enter all the configuration (except the user part). In such a situation, the absence of configuration backup/restore is regrettable! I also sometimes see that the picture is in black and white during the day, which is due to the night view mode triggering way too easily! Although there's room for improvement, the Tenvis IPRobot3 is a surprising device that complies with standards normally found in more expansive IP cameras. The interface can be somewhat more confusing than average, and also can be slow and unstable at times. I'd wish to see more advanced information available on their web site, like the streaming examples above. The 720p image, while not the most colourful, is sharp and a bit wider than usual. I made some comparative snapshots. Tenvis offers a real Technical Support and Forum and releases regular updates so let's hope that this young model will evolve to its full potential. - Tenvis has an active customer support service including their own forum. (2014 update) - After dealing with many ONVIF compatible cameras, it turns out that the IPRobot3 (old and 2013 models) despite all its flaws, has the most complete ONVIF implementation -with PTZ and audio- when it comes to works with Synology Surveillance Station, So it is an ideal candidate for that kind of use. - No backup/restore function for configuration. - Would need an option to keep some recordings (videos) on the SD Card. - Somewhat picky on microSD cards used. - Stability problems at time. - Tends to stick in night mode (IR and B/W picture) even in full indoor light. - Proprietary .v264 video format requires Windows (only) program to view. Today my IPRobot 3 was shipped. I managed to run it with Onvif Device Manager. Sometimes there was no video signal although I could control the PTZ. However, more important to me is controlling it with my Synology DS213+. But it isn't able to autodetect the camera. If I want to set it up manually (with the same settings as in your screenshot), the camera loses the connection to the network and I have to cut the camera from the grid. The firmware of the camera is 1.1.6.2. How did you set up your camera? sounds like you work for temvis. Your english is just like the tenvis website english !! Same for me with the Onvif Device Manager. My DS109 (DSM 4.1) with Surveillance Station 6.0.2353 does not auto-detect the camera neither, and the test button does not work. But if you save the camera as ONVIF with the right credentials, it works. I didn't test for long because it's of limited interest for me without PTZ control. I'll check that out though. The IPRobot is indeed quite unstable anyway, it sometimes boots only with rtsp and telnet services only, not the web service. @alexandre: this camera is a good base but the software needs (more than) ironing. Hopefully Tenvis proves very reactive and willing to improve their product! They're very open to suggestions so do not hesitate to leave a feedback on their forum. The ONVIF configuration is indeed problematic. I must have been lucky the first time, but now it almost always crashes the camera. I'm now using the Brand "User Define"
X can be 16, 24 or 32 depending the resolution wanted (max is 32 for 640x480) . Since the user and password are already in the url, you can leave those last fields empty, and just hit OK.
At least, this won't crash the camera. Thanky you for your hints. But I didn't get the camera to work properly. Today I returned it to get a Wansview NCH536MW. How did you upgrade the firmware since I cannot find a firmware on Tenvis website for the IPROBOT3? 1.1.6.2 is found at the end of this thread on the Tenvis forum. I would like to buy an Tenvis IPRobot3 or Dericam h502W to use as an babymonitor. As you have experience with both camera's can you tell me which you would suggest? I hope you can help me to choose, I've read both articles here and for me both look ok but I have no "hands on experience". H502W has my preference for the moment due to it's better overall stability, but has no sound detection. Hi there again, I found another problem: I set up correctly the FTP server and the folder is correctly created but every time the Cam detects a motion it will not send any snapshot to the FTP server even if it is flagged to do it. Only the first time it tries to upload a Jpeg file but it is of zero length. Could be due to the default ftp strategy which is "delayed". The files are first stored on the sd card then uploaded some time after. Try "real time" and make sure the "Save picture to network storage" is ticked. Hello, I read that the camera can be accessed from "anyware, anytime". How does this work? Does it need a fixed IP address? or there is website to access with user and password to view and control de camera? The camera is given a reserved DDNS address by Tenvis which is printed on a label, like the example in this other Tenvis review. The cd-rom provided contains a setup wizard to make the process as simple as possible. Hi, I have bought the iprobot3 and the problem I am having is that it gives false motion alarms especially in night mode. I was thinking of adding an external PIR and use that to trigger alarms instead of the iprobot3 motion detection , but my camera does not have the input /output connectors. So I am thinking of returning it and try and get an iprobot3 which does have a connector (might be difficult to find)or modify the one I have. Please could you advise. Why don't the cameras us pir instead of motion detection , pir seemd far more reliable. Hi Vijay, there are actually non-ptz H264 cameras with PIR. A very good one is the AVtech AVN813, it's far more expensive though (~250€) but has the RS485 connector you're looking for, and also SSL web access which is unvaluable! For a cheaper alternatives, a PTZ H264 with RS485 (but no PIR) like this one, or somewhere in the middle, the EyeSpy247PTZ (not HD). The links are just indicative and I didn't test any. If I had to choose in that list, it would be the AVtech most certainly. Hi Bubbah, Thank you for your reply I will check out the models you mentioned, but I don't understand why PIR makes them more expensive. I have PIR lights that cost very little and don't give false switching. Has anyone been able to split the files in the 1.1.6.2 firmware? If someone could help, that would be great. I found that J9 on the main board is the serial console and with a USB to 3.3v TTL converter, it works great. The baud rate is 38400 n81 no handshaking and the pin order is 3.3v, gnd, rx, tx on the pcb (do not connect 3.3v and swap TR/RX from the converter). They are using U-Boot as the bootloader. With hyperterminal you can watch the linux bootlog of the camera as it loads or hit ESC in the first 2 seconds to get into U-Boot. Uboot has a lot of commands. Currently I am getting an error when I try to access the Flash with “sf probe 0.0”. I have a different device, but U-Boot should behave fairly similar. On my device, one can run "sf probe 0", "sf read 0x0 0x0 0x800000", "md 0x0 0x800000" to dump the whole SPI content to the console. Assuming that your camera sends something similar over the UART, you can use it to split the SPI dump. I'm unable to add my IPRobot3 (ver 2014, latest firmware: v 1.2.1.4) camera to the Surveillance Station (6.3-3380) on my Synology NAS 413J (DSM 5.1-5004). It doesn't work with [ONVIF] or [User Define] options as mentioned in various forums. I saw a section that advised that ONVIF has to be set to "Do not require password" in the camera setup, but that option is not available in the camera interface (perhaps 2014 version has that option disabled). Do you guys have any ideas on how to setup this camera within the Surveillance Station?